Hi there! It’s me, Lillian. I’ve been trying out some new techniques for my upcoming self-help book. The working title is “How to Properly Avoid Sleep and Other Ways to Train Your Parents.” The techniques seem to be working, as Mom is currently walking around in a zombie-like state undoing all my hard work of making sure there is at least one toy on every square foot of the house. In fact, I might have to take a break to grab on to her legs and make sure she doesn’t do anything silly like put the milk in the cabinet. Again. Like I said, the techniques have been very effective. So, while Mom is distracted, I thought it would be a good time to take over her blog and tell you what’s really been going on around here. First of all, Mom is very sorry that she hasn’t written in a while. She throws out phrases like “best intentions” and “life happens,” but what she really means is that she’s been trying to juggle work, reading Where’s Spot? and my Pride and Prejudice board book, watching Tangled with me 1,000 times, and taking me outside. I love outside. I keep telling her that she could just let me go outside and she could write inside, but she never listens. She insists that she follow me everywhere. 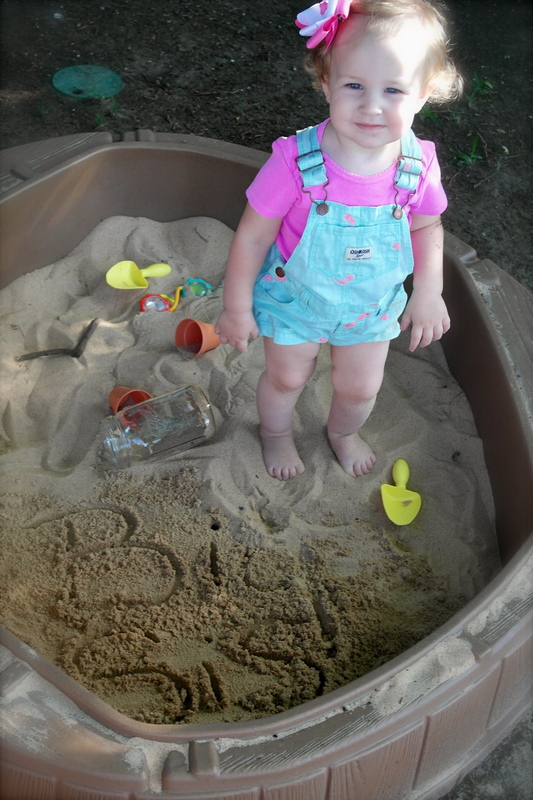 Apparently, playing in the backyard sandbox bores parents after a while. I would be perfectly content to play there three times a day, but Mom insists on getting me dressed and out of the house. 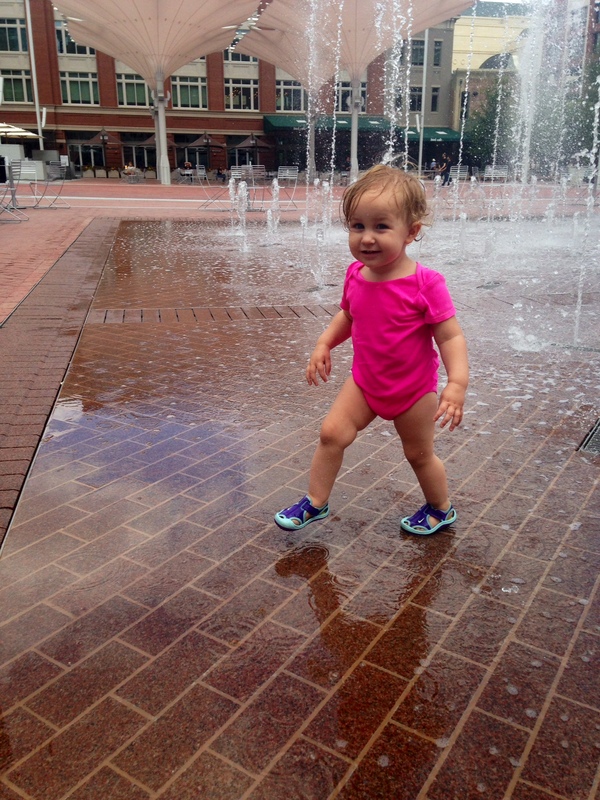 Just yesterday we went to Sundance Square to play in the fountains. My buddy, Marcus, came too! It was pretty awesome (well, unless the water got in my face). I can’t complain too much. She normally takes me really cool places like the park, the zoo, or somewhere else outside. Trips to the grocery store are thrown in there intermittently, but those are okay, I guess, as long as she lets me ride in the cart with the steering wheels. If not, I quickly let her know that we need to leave. 4. I’ll have someone to boss around. Er, I mean, care for. Oh, one last thing. I’ve realized that Mommy never really mentions what’s going on in Daddy’s world on here. Daddy’s doing really well. We visited his new office yesterday. It has a giant cubby, perfect for crawling and climbing on. So, I obviously approve. Before Daddy gets all moved in to his office, I’ve been trying to teach him how to read. I hear it’s an important skill to have if you plan on conducting business. I make him read at least 15 picture books per day, and sometimes insist that he read two at once. That about sums up life right now. I’m going to go insist Mommy take a break from all her hard work to read (me a book). Love this! Congratulations to you all on the promotion to big sister and parents to two!